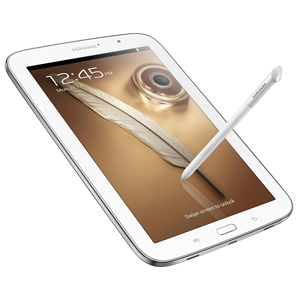 Despite the smaller size, the Galaxy Note 8.0 shares a lot of internal hardware with the Samsung Galaxy Note 10.1. Both devices feature the Samsung Exynos 4412 processor and share a 1280 x 800 screen resolution, although the Note 8.0 has a slightly higher clock speed and ppi. While some may not favor the device’s ‘tweener size, others will find the increased portability a welcome change from full-size tablets.